ISFJs are quick to lend a hand to those who need it, especially to people in their families and communities. Refusing their help can make them feel insulted and frustrated. If you truly don’t need their help with something, it’s better to say something like “Thanks so much for asking, but I think I’ve got it right now!”. Don’t refuse their help just to be passive aggressive. ISFJs like time to process information and details before they speak their mind or make a decision. Their quiet nature can be misconstrued as passive, when it is anything but. Don’t rush them to speak, and don’t act as if their silence is a defect. ISFJs are perfectionists when it comes to their projects and tasks. Don’t overwhelm them by giving them excessive criticism or assuming they didn’t try hard enough. If you have criticism to give, try to notice the things that were done right and praise those things while asking if they need help or input on some of the areas where they are struggling. ISFJs hate to be interrupted. They may act polite and calm if this happens, but believe me, doing this is a sure way to cause tension in your relationship. Si-dominant types think carefully before speaking and put a lot of thought into making sure their words are framed correctly. Interrupting them, cutting them off, or sharing your opinion without giving them a chance to finish theirs, is a major no-no. 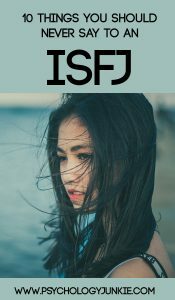 As Extraverted Feeling (Fe) types, ISFJs often need to talk about their feelings and emotions in order to get a better grasp of what’s going on inside. They are more attuned to outer emotions than inner ones, and so being able to discuss their feelings helps them to sort them out. If you belittle their experience or their emotions, it frustrates and/or embarrasses them. ISFJs need to know they can count on the people in their lives. Being responsible and dependable is something they are known for, and they appreciate this in other people. Try hard not to be wishy-washy or unclear. Let them know for sure what your intentions are, and if you can’t do this, say something like “I just need time to think things over, and then I’ll get back to you”. ISFJs may be gentle and considerate, but patronizing them will get you nowhere. These types can be tougher and more harder-working than many more outspoken/blunt individuals. Mother Teresa was an ISFJ and she worked in the world’s toughest slums helping the “unwanted, the unloved, the uncared for”. She didn’t flinch when she saw sickness or recoil from telling the truth of her heart. Gentleness and compassion should never be misconstrued for weakness or naivety. Healthy ISFJs are incredibly devoted and generous with their loved ones. Unfortunately, some people notice this and like to find ways to manipulate them into doing more. They may accuse the ISFJ of being selfish simply to get more out of them or to put them on a guilt trip. I’ve spoken with so many ISFJs who have dealt with narcissists and manipulators who used their generosity to attempt to control them. Don’t be that kind of person. ISFJs like to be prepared and know what to expect. Having to spontaneously react to situations without a clear goal or set of instructions can be extremely stressful for them. Try to prepare them ahead of time for changes in plans, and give them time to think of an effective course of action. Si-users have been given an undeserved bad rap in many online communities. People make jabs about Si-doms being “stuck in their ways” or overly traditional. The truth is, ISFJs learn from what has worked well and succeeded before. They notice cause and effect, and they keep track of steps that have led to a positive outcome. They are excellent at remembering details about the things (or people) that are important to them, and they can effectively recall those facts and details to improve or fix a current situation. This ability is extremely useful! Do these phrases bother you? What words especially get on your nerves? 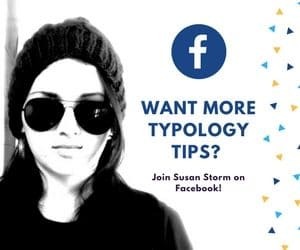 Share in the comments!